조선시대 만들어진 백자 항아리로 큰 항아리와 작은 항아리 두개가 있다. 큰 항아리는 총 높이 34.0㎝, 높이 27.2㎝, 아가리 지름 10.1㎝, 밑 지름 13.7㎝이며, 작은 항아리는 총 높이 12.5㎝, 높이 9.5㎝, 아가리 지름 4.2㎝, 밑 지름 5.7㎝이다. 아가리 언저리는 밖으로 말아 붙였으며, 아가리 부분에서 서서히 벌어져 어깨부위에서 팽배되었다가, 풍만하고 여유있는 곡선을 그리며 서서히 줄어들며 바닥면에 이른다. 뚜껑의 윗면 중앙에는 연꽃봉오리형 꼭지가 있어 손잡이가 되며, 그 주위로 낮은 층단이 있다. 유약은 엷은 청색을 머금고 있으면서 내·외면에 고르게 씌워졌으며, 태토와 어우러진 표면의 색조는 유백색에 가깝다. 아가리의 형태적 특징과 바탕 흙, 유약, 표면의 색조, 구워낸 방법들로 미루어 조선 초 경기도 광주에 있는 국가가 경영하는 가마에서 만들어진 것으로 보인다. 이 백자 항아리는 조선 전기의 격조와 유연성을 가지고 있는 뛰어난 품격의 작품이다. 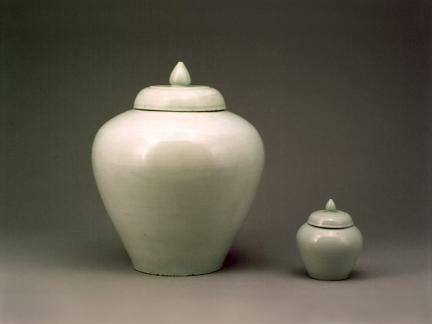 These are two large separate earthenware pots called Ipho and Wonho. 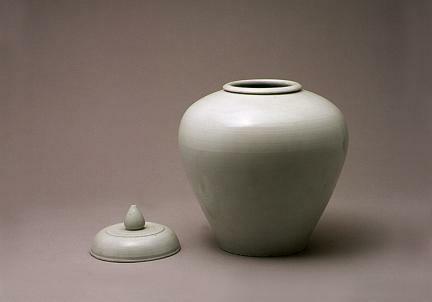 The total height of the bigger pot is 34.0cm. It is 27.2cm high with a 10.1cm wide mouth and 13.7cm wide base. 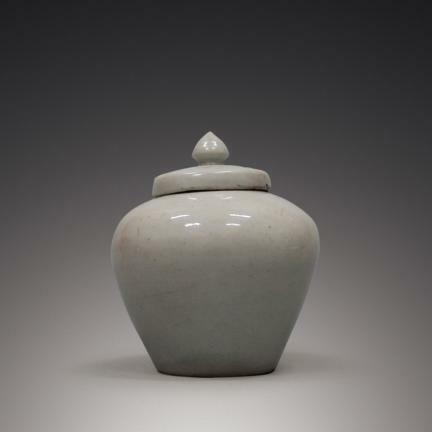 The smaller pot is 12.5cm in total height, and 9.5cm high with a 4.2cm wide mouth and 5.7cm wide base. 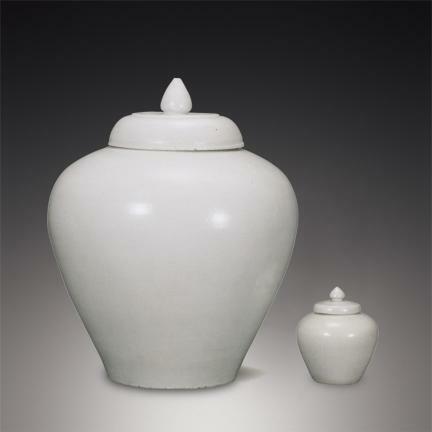 These two pots are almost identical in shape, and correspond to typical pottery of the early Joseon Dynasty. The lip of the opening is rolled out to the side of the pot, and curves out gently flowing to the shoulder. Plump and composed curves narrow to the bottom of the base structure. The lid handle is in the shape of a blossoming lotus flower, and around that are a couple of layers. 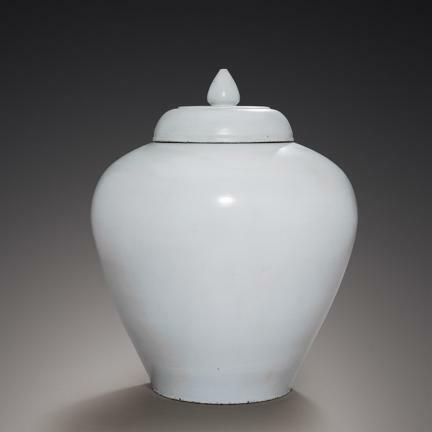 The glazing for this earthenware has the color of pale blue spread evenly all around. 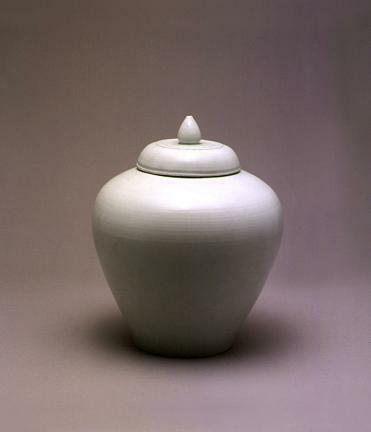 Assessing the structure, colorimetric design, and the cooking technique used in this pot; it is presumed to be from the government controlled kiln at Gwangju, Gyeonggi-do during the early Joseon Dynasty. 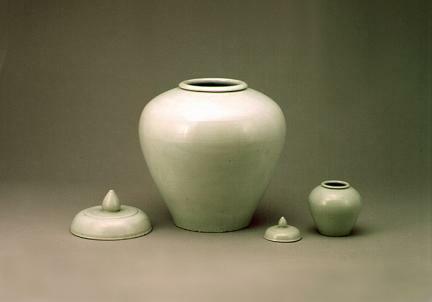 The point of Joseon Dynasty's pottery is the plain white celadon. 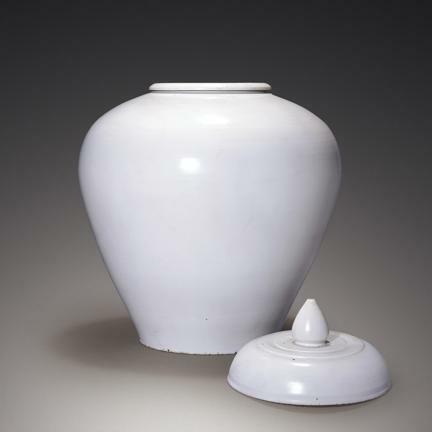 The early white celadon developed during the Joseon Dynasty corresponds to the spirit of the newly developing era.